My very first makeup tutorial!! I take only 10 mins to do my makeup whenever i'm going out. But i didn't know doing a tutorial on this simple makeup takes a lot of hard work!! Took about 400 photos and i'm only using these few hahah! There are 5 parts in this. Really hope I can help those girls out there who wants to start applying makeup but don't know where to start. But if you are already putting makeup regularly, feel free to try out any part of this tutorial! Don't look down on my kiddy pink brushes, they are also branded okay! HelloKitty brand hahaha. They are super soft, and most importantly, super cute! Also my very first Girly Lashes I got from the GirlyMake launch party! I chose No.2 as i feel they are the most dramatic, and very dolish! Stay tuned to the end of the tutorial to see my eyes transform! So I start off with a clean bare face, right after washing. This way, there won't be any excess oil trapped underneath all the foundation. 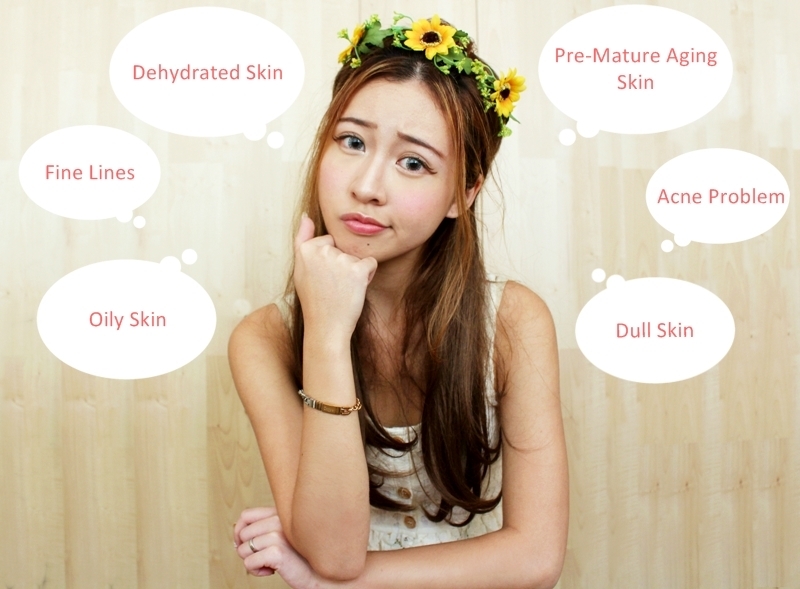 Since my skin is very very sensitive, I have to be careful of what I put on my skin so I only use skincare products from Neways. My shampoo, conditioner, toothpastes and everything are also from them and have been using them ever since i was 2 years old! They are an American company that manufactures personal care products, nutritional supplements and more. It's really good as they don't test their products on animals and have no harmful chemicals. Harmful chemicals in your everyday products are one of the top reasons people get cancer :( So be sure to take time to check up the ingredients before getting any new products. What i'm holding up is my Moisturizing Foundation from their makeup line- True Touch! It's very suitable for people with dry skin, like me! Using the darker shade to cover up any blemishes, redness and under eye circle as i find it gives more coverage than the lighter one! Since it's an everyday look, you don't want to do heavy highlighting and contouring. So i'm using the lighter shade as a mild highlighter on my face! Just dab on 5 areas of your face as shown bellow, and blend! You will notice just slight difference on your face- forehead, nosebridge, cheekbones are slightly higher, chin is slightly sharper. Don't worry if it's not much a difference, will do some contouring later! An eyebrow tutorial that some people have been requesting!! 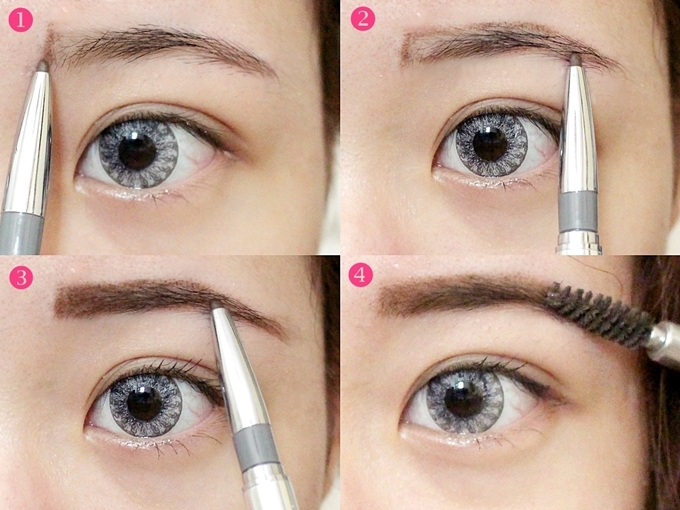 Not an expert in this but I hope I can help those girls out there who are new in drawing their eyebrows. But make sure they are neatly groomed. (means no stray hairs above and bellow your eyebrows) It can be accomplished by tweezing or waxing. But for first timers, shaving them will also be good. 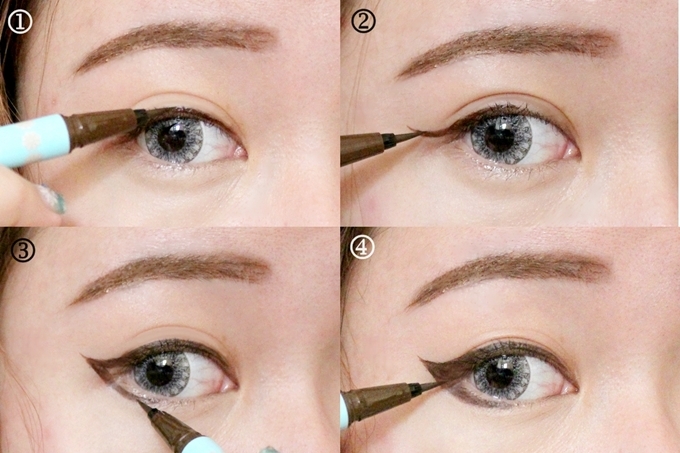 Step 1: Draw a line just slightly further from the end of your eyes. People say that it must be aligned with the start of your eyes. But not true! Closer eyebrows, sharper your nose will look. But please don't draw too over, until almost have unibrow LOL! Step 2: Outline the shape of your eyebrows. I like my eyebrows slightly thick, and not too arched. But it's up to you to draw whatever shape you like. It's also good to follow your natural eyebrow shape. This is not necessary to some people, but if you have lighter color hair, this is important! Im using Dolly Wink Eyebrow Gel (#3) that I bought at JRunway! But I guess you can also find them in Watsons and Guardian. Step 2: Wing it out! Step 3: Draw a curve from the winged end, down to the half of your lower lash line. Step 4: Fill the gap in! Start from just bellow your eyebrows and work your way straight down. When you reach the tip of your nose, just draw a V. Now you have an illusion of a taller, slimmer, and pointier nose! How it looks like without guide lines. Finally! The exciting part, wearing the eyelashes! 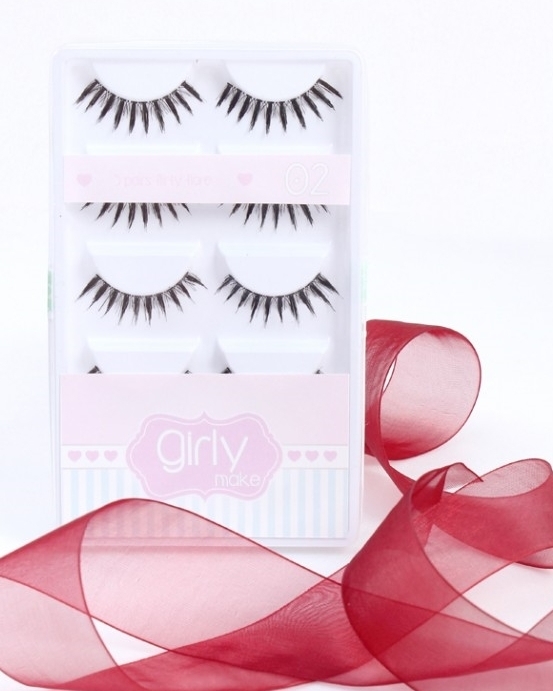 I'm using Girly Lash Flirty Flare No.2! It's been a really long time since i've worn faux eyelashes because it's really uncomfortable for me. Whenever I had any stage performances, I dreaded wearing eyelashes because the cheapo eyelashes I used are always so itchy! The lash bone is very hard and keeps poking the sides of my eyeballs T_T They are heavy too which makes me very hard to open my eyes Hahah! But this, THIS is really light and comfy! 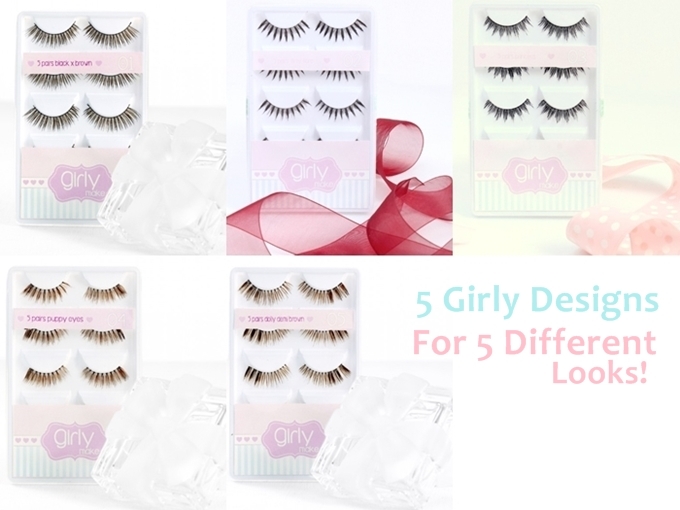 Judging from the price of GirlyMake lashes ($17.90 for 5 Pairs), the quality is really good! Lashbone is very soft and it doesn't poke my eyeballs :D The hairs looks very real and doesn't have those plasticy kind of look (that most eyelashes have). Here's a closeup of the lashes! There is a mixture of criss cross and separate lashes for that extra drama. I'm using DUO waterproof eyelash adhesive in Dark Tone! OMG see my eyes!! I swear, 0 photoshop on my eyes! Only lenses, makeup, and GirlyLashes! I'm using The Maybelline Rocket Mascara to blend my real and faux lashes together. I remember looking for it after seeing Xiaxue's video on putting it to the test. But everywhere is sold out! :( This shows how good it really is. But I finally bought it in Malaysia 2 months ago and i've been loving it so far! Just a few more touches! Using True Touch Radient Blush in Rose Pink! Slight contouring! Still haven't found a good bronzer yet so this is from Daiso also T_T Omg i feel so silly now HAHA! If you have any good bronzer to recommend, please please let me know! And finally done!! This tutorial looks really long, but actually I only take 10 mins to do this look! Also do check out their eyelid tapes, it's really good! GirlyMake is also having a Roadshow booth tomorrow and I will be going!! It's very exciting cuz you will be able to try out those GirlyLashes and eyelid stickers! Phew! Such a long long post. But it's all worth it! Here is what i'm wearing few days ago. Floral and Lace vivi inspired dress that I thrifted. Paired it with a braided brown belt and a tassel bag! Also wore my super comfortable wedges. Really made for walking! Hope this post is able to help some girls out there!